Please note that you may not be able to run certain programs on certain versions or editions of Windows. The most basic example is the attempt to run a 64-bit program on a 32-bit version of Windows. There is no workaround for that obviously, other than trying to download a 32-bit version of the software and running it. This app can't run on your PC. To find a version for your PC, check with the software publisher. This app can't open. [App name] can't open while User Account Control is turned off. This app has been blocked for your protection. An administrator has blocked you from running this app. For more information contact the administrator. You may fix some of the app opening issues right away as it is quite clear why the error is displayed. If you run a 32-bit version of Windows, you do get the error message when you try to run a 64-bit program. Solution: Visit the developer website and download the 32-bit version (provided that it is available). If you run a program that is designed for a particular version of Windows. A program designed for Windows 10 may not run on Windows XP and vice versa. Solution: Try to find a compatible version. You may have to download an earlier version of a program if you try to run it on an older version of Windows. The most recent version of Google Chrome won't run under Windows XP anymore for instance no matter what you try. You can also try and enable compatibility mode for the program. Right-click on its executable file and select properties. Switch to the Compatibility tab, enable compatibility mode on it, and set the target operating system to a different version of Windows. If that does not work, you have one more option that you can explore: install a virtual machine software, e.g. VirtualBox, create a new Windows virtual machine image using ISO images that you can download from Microsoft, and run the program in the virtual environment instead. If you get this error message, you get the solution to the error delivered with it immediately. Basically, what you need to do is enable the User Account Control feature on the Windows machine to start the application. The restriction is not that strict anymore on recent versions of Microsoft's Windows 10 operating system. You can run Photos and other applications on machines running the Creators Update for instance even if the User Account Control is turned off. Here is a list of generic solutions you may want to give a try to fix the "this app can't run on your PC" error. Try an older or newer version. A particular program version may have a bug that prevents it from being run on some systems. This is not that uncommon considering that there are so many different hardware and software configurations out there that developers cannot possibly test them all. If the developer has no old versions archive, try the Old Version website instead or third-party download portals. Try running the program with elevated privileges. Some programs require elevated privileges to run. Right-click on the program and select "run as administrator". Check the logs of your security solution to find out if it interfered with the program. Most security programs come with options to whitelist executable files. You may want to try this after you have made sure that the program is not dangerous. Try enabling sideloading if you try to load a Windows application that is not from Windows Store. You find the option under Settings > Update & Security > For Developers on Windows 10. Run a security scan of the system. Malware may prevent some programs from running. You may want to use second opinion scanners as well, e.g. Malwarebytes. If you search for the error online, you will come across sites that post a number of suggestions on how to resolve the issue. The following is a brief collection of suggestions that won't help, and may even be counterproductive. Disabling SmartScreen filtering. SmartScreen is a security technology that Microsoft built-into Windows that checks applications for potential security issues. If Windows suspects a program to be potentially malicious, it displays a prompt to the PC that tells the user that the program was blocked from execution. It is possible to bypass these SmartScreen messages, and that is the main reason why telling users to disable SmartScreen is not productive at all. Repairing the Windows Registry. Another often-seen suggestion is to repair the Windows Registry. Since all Registry repair programs out there will only fix basic issues, running these won't fix the problem of not being able to run certain software programs or applications on the Windows PC. Now You: Have other tips on how to resolve the error? Find out how to resolve the error message This app can't run on your PC when you try to run programs or apps on machines running Windows. Any thoughts on why the “This app can’t run on your PC” error would suddenly affect a program that had already been installed and functioning properly? Some quick thoughts: program update? Microsoft updating its compatibility list? Windows update? Thanks. Windows update seems to be the most likely culprit. The program itself hasn’t been updated in years. The author doesn’t reply or I’m not even sure he/she still has a pulse but the program is still quite powerful even though old and gives quick ideas on object mapping. Don’t try to buy it though the keys are corrupted when you receive them which is a shame. Right click the setup file and then click Properties. 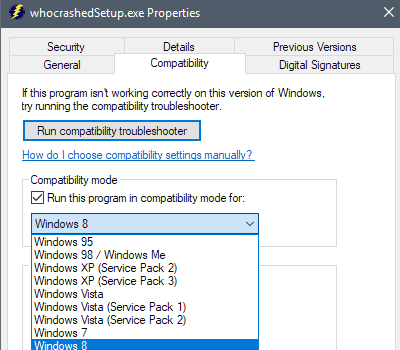 Click the Compatibility tab next and then choose to install it in Compatibility mode for Windows 7. As an added precaution checkmark the box to “Run As Administrator”. Click Apply/OK and then run the setup file. CCleaner get’s this message every time W10 crap got an update. A sad commentary on the state of today’s consumer level software. On one hand, the programmer of the above error routine CAN’T BE BOTHERED with putting more information in a details tab (for print out, PDF save or email forwarding to tech support). On the other hand, the old school M$ Blue Screen Of Death wasn’t helpful either unless you could transcribe it or take a picture of it for tedious further investigation. There used to be a middle ground ….. Compatibility mode helps nada, from Vista, for my music studio that uses older java runtimes (runs OK in ME, 2000, XP and XP x64). Microcrap pulled the support for them already in Vista, even if we music producers asked them not to. Microcrap will always be Microcrap…. I had the “can’t save problem” and it also prevented me from installing software for an Epson scanner as well as Chief Architect Home Designer software. Also, with a graphics program, I could not save to the desktop, but could save to other locations. Supposedly CDA is not activated when the update is in place, but somehow, mine was active. It gave me grief as soon as the update was in place, which lasted until I read the first article below.